Dr. Damian Redfearn introduces the newly installed Electroanatomic mapping system during its official opening. One of the clinical fellows collecting intracardiac electrograms during a catheter ablation procedure. 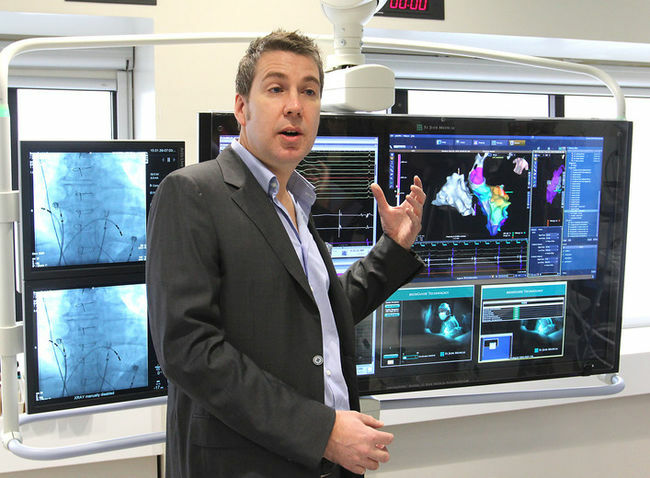 Cardiac Arrhythmia Signal Analysis (CASA) Laboratory is a multidisciplinary research lab established and directed in 2007 by Dr. Damian Redfearn. In CASA we focus on analysis of surface and intracardiac electrograms obtained during arrhythmias such as atrial fibrillation and ventricular tachycardia to propose new methodologies or to improve the existing interventions. We have close collaboration with Heart Rhythm Services at Kingston General Hospital which gives us access to a unique database of electrograms and patient demographics for retrospective studies. This collaboration also facilitates design and conduct of prospective studies. The CASA lab provides a unique, clinically oriented training environment for graduate students in all levels who are interested in biological signal analysis and system computational modeling, stochastic processes, and analytical methods within a electrophysiology context. CASA has strong ties with domestic and international industry partners which will give the students the chance to have exposure to industry through short term internships.